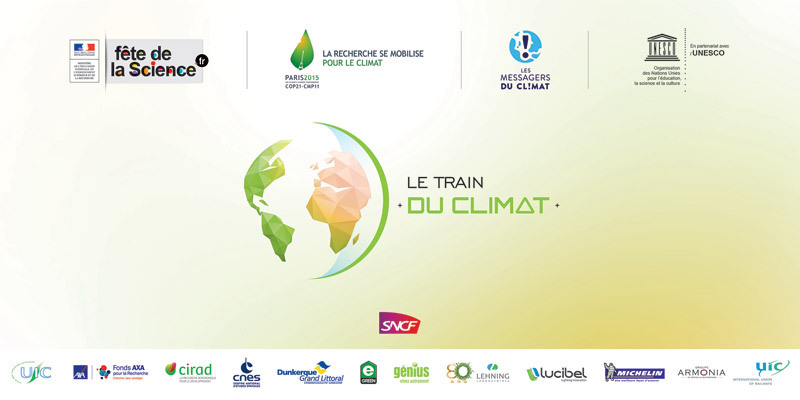 UIC is pleased to announce that from 6 – 25 October 2015 it will board the “Climate Train” ("Train du Climat"), a travelling exhibition within city centres launched by Trains Expo Evénements SNCF, the events subsidiary of SNCF, which regularly runs themed trains such as the TV Train, Chocolate Train, Historic Train, etc. This train is supported by the French Ministry of Education in partnership with UNESCO. Each stop made by the train in one of the 19 towns and 13 regions across France will be an opportunity to bring together all the economic, political and associative stakeholders around the issue of climate change. The “Climate Train”, endorsed by the COP21 Intergovernmental Committee, will be a national event as part of France’s Science Day, taking place from 7 – 11 October 2015. Three coaches will be dedicated to partner companies or organisations, including UIC. The train will be able to hold 4000 to 10,000 visitors a day. School groups will also be welcome on board. The 350 metre-long train, will be composed of 14 coaches, three of which will be dedicated to a fun and educational exhibition developed by scientists and researchers, and three “Village” coaches, where partners involved in climate issues will be able to showcase their initiatives in the fight against climate change to preserve the planet. These include Armonia, AXA, Cirad (French agricultural research and international cooperation organisation), CNES (National Centre for Space Studies), eGreen, Génius, Lehning Laboritories, Lucibel, Michelin, the Union of Chemical Industries, as well as the International Union of Railways. For UIC, which will coordinate a synchronised network of trains across Europe, Asia and Russia just before the start of the COP21 negotiations under the global campaign known as “Train to Paris”, the “Climate Train” is a way of reaching out to the French public and showing that UIC has been committed to the climate change issue for several years now, by leading long-term initiatives to develop sustainable transport systems at global level. This event will also serve as an opportunity for UIC to meet the school sector, which is less familiar with UIC’s activities, and to foster an educational dialogue with future generations, for which climate change is also a relevant issue. At the end of November, trains are scheduled to depart from Berlin, Bonn, Frankfurt, Brussels, Rotterdam, Milan, Madrid, Barcelona, London, Lisbon, Moscow, Beijing and Ulan Bator. These trains, which will bring delegations to the COP21 negotiations in Paris, are intended to highlight the importance of developing sustainable transport systems, forming part of the solution to climate change. This meeting of trains on 28 November 2015 will take place on the weekend preceding the COP21 negotiations. Among the events linked to this “Train to Paris”, UIC is planning to organise a unifying and symbolic event with high-level representation from the United Nations, the French government, the European Commission and the main stakeholders from the rail transport community, comprising both the private and public sectors.